CHANDLER, Ariz. – Father Time has a new name. 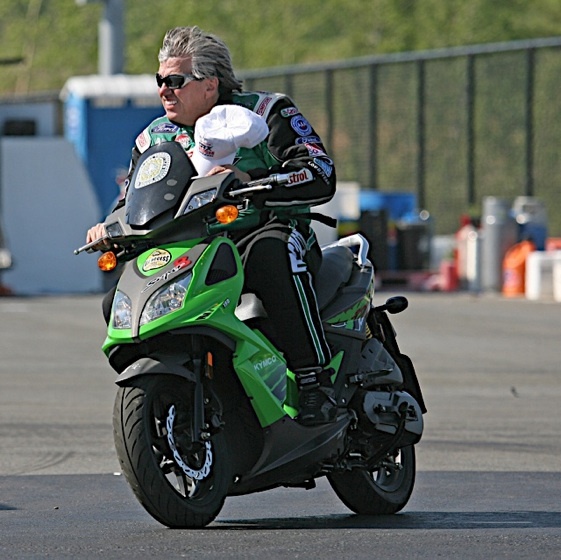 It’s John Force. Force, 62, loudly silenced a miserable stretch of eight first-round losses by pouring his infamous Castrol GTX High Mileage Ford Funny Car into Victory Lane last week in the season-opening NHRA Full Throttle Winternationals at Pomona, Calif.
Don’t put it past an ageless Force to make it two straight trips into the winner’s circle at this weekend’s Arizona Nationals at Firebird International Raceway, a site that over the years has been overly friendly to John Force Racing. Eight times a JFR machine has won at Firebird, all eight by drag racing’s equivalent to Old Man River. No one has been better than Force for most of the past two decades, a span that has produced 15 titles and umpteen wins (134). Force, however, slipped badly in 2011, posting just one win and finishing No. 9 in the final standings. “I think he’s going to contend for another title this season,” said Cruz Pedregon, whose 1992 championship run made him the only driver in the 1990s to win a crown other than Force. “But I think he’s going to be one of many. “The thing about John is he’s the epitome of a tough competitor. When you look up tough competitor, there will probably be a picture of John. Even at his age, he looks like he keeps himself in pretty good shape. Still, ask any driver on pit road and all would agree that overlooking Force would be a hearty mistake. At the moment, Force doesn’t appear finished leaving marks for others to gawk. “I still want to win and I still think I can,” Force said. “(But) no matter how hard you try, you still have to have a good hot rod. And last year I just didn’t have a heap that could win. I had my crew chiefs (Dean Antonelli and Ron Douglas) running (daughter) Courtney’s test program and they were just spread too thin. Hagan has seen enough to know Force won’t be a pushover this season. “What we do is not so much physical said. “Yeah, we pull 5 G’s (G-forces) on a run and maybe close to 6 negative G’s when the parachute comes out. But that’s only for four seconds at a time. No, what we do out here is a mental game. “You have to be sharp mentally. And (Force) has still got his mind. He might have been through some crashes, been on fire and beat up, but the guy’s smart. He knows how to get up there (on the starting line) and make things happen. – Mark Armijo is the long-time auto racing beat writer for the Arizona Republic and a frequent contributor to RacinToday.com.